A few weeks back, I visited Artistry cafe to try their brunch menu and of course, coffee! This is the first time visiting a cafe / gallery and I can definitely tell that the owner put in a lot of effort into creating this quaint, comfortable space for people to enjoy their meal and coffee. I love how the wooden table with the contrasting colour compliment very well as the background for this shot. Their plates looks like it was made right out from a pottery class, definitely very unique! The coffee was pretty decent but I would say Artistry cafe is one of the cafes with better food. Their panini was scrumptious and their big breakfast, albeit with its simple ingredients, was appetizing. I would suggest this cafe to everyone! 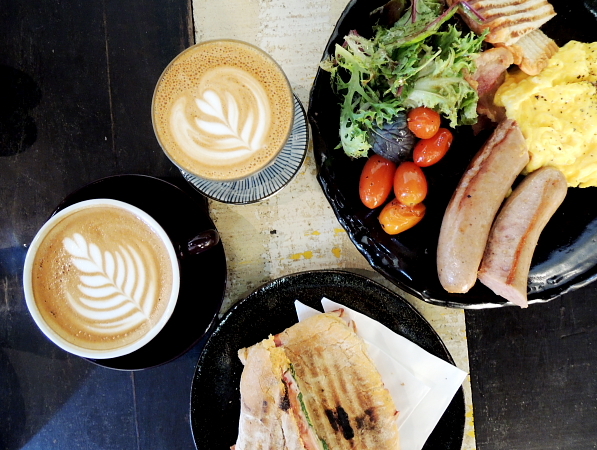 As my friend and I explored the hip bugis area, we decided to try out this cafe – I Am Cafe – right at the beginning of Haji Lane. When we realize that almost every table has ordered the rainbow cake, we knew we had to try that as our dessert for the day. This cake is so tall, it has to be served flat on the plate! My friend and I have definitely over-estimated ourselves. After a heartful meal at Artistry cafe, it is almost impossible to finish this cake on our own! Just a heads up, this is not a cake meant to be devoured alone, unless you are that hungry of course! With more and more cafes carrying the rainbow cake, I would say that this cafe is clever in its tactics. However, the cake could be made better. You can see that the red layer of my rainbow cake is still under-baked. The cream cheese frosting was good but overall, the cake might be a little bit too sweet. Nevertheless, everybody still enjoys some rainbow in our life, don’t we? Oooo, thanks for sharing! Can’t wait to visit more cafes and share them on my blog.